I remember the first time I ever visited a Coldstone Creamery and saw that they offered Cake Batter Ice Cream. At first I was indifferent, never being one to lick the bowl clean of cake batter (brownies are another story though) but one time Tom ordered it and let me try it. Oh sweet sugary calorie laden heaven was that some incredibly tasty ice cream! We quickly realized that repeated trips to Coldstone were not improving our waistlines and promptly gave up the ice cream. In June, that will have been four years ago. Four years since I’ve had anything with the cake batter flavor. 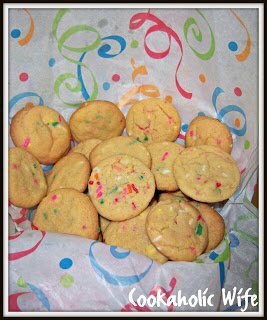 Then Pinterest became popular and I found tons and tons of recipes calling for cake batter. I couldn’t help it, the pretty sprinkles drew me in. What? I’m a sucker for pretty colors. I won’t make you wait any longer for this recipe that I highly suggest you make immediately. Unless your on a diet. Then I’m really, really sorry for posting this. 1. Preheat the oven to 350. Grease your baking sheets or use silpat liners. 2. In a small bowl, mix together the flour, baking soda and salt. 3. In the bowl of your stand mixer, add butter, brown sugar and sugar. Mix on medium speed until well combined. 4. Add the vanilla pudding mix and yellow cake mix. Then add in the eggs one at a time, scraping down the sides if necessary. Add vanilla. 5. Slowly pour in the flour mixture and mix until combined then add the sprinkles. 6. Roll dough into 1″ balls and place 1-2 inches apart on the prepared baking sheets. 7. Bake for 10-12 minutes then transfer to wire racks to continue cooling. I won’t lie, these were actually sweet enough to hurt my teeth when eating them but they are absolutely delicious! When they first come out of the oven they’re soft and chewy and as they cool they get harder but somehow the flavors combine more. I don’t know how but they’re too tasty for me to worry about figuring that out. And aren’t the sprinkles pretty?